"I'm sorry sir, this road is closed." The Navajo Tribal Police officer stepped from the roadblock and peered into my car through darkened lenses, as if she was looking for something. Finding nothing out of the ordinary except for a mountain bike and assorted camping gear, she explained. Three anti-government zealots had killed a police officer and disappeared into the canyons, sparking one of the largest manhunts in the history of the Southwest. Since they had last been seen near Bluff, Utah, the entire town had been evacuated. I'd have to find another way to get to Grand Gulch, where I planned to spend 3 days exploring one of the largest concentrations of Anazasi ruins on the Colorado Plateau. I felt a flicker of fear as I turned down a dusty side road, taking the long way around. I arrived at the ranger station a little under 2 hours later. The setting sun coaxed a tropical green from the hillsides of junipers in every direction. No one answered my knock. After a nervous glance at the "Warning: Manhunt in Progress" sign on the door, I locked my mountain bike to an antenna in back and made sure my name and return date were written very clearly in the trailhead register. After a short drive to the south I pulled off onto a dirt road and parked. An almost-full moon had just risen as I stepped into Bullet Canyon, which wandered gently downward to the west. Bats flitted silently from one blue-lit canyon wall to the other. My shadow led the way past small pools where unseen frogs wurped and shreed in the shadows. I turned on my headlamp only briefly to negotiate a few minor scrambles as I made my way down into the earth. Bold, wide-eyed mice with outsized ears investigated my pack as I set up camp, ate and fell asleep under whispering trees. The rising sun forced the full beauty of the canyon on me all at once. Sheer walls in every shade of white, tan, red and brown rose on either side for hundreds of feet, close enough for comfort but wide enough to stave off claustrophobia. The trail wound down a dry streambed tangled with cottonwood, willow and tamarisk. Aside from the Rufous-sided Towhees rustling under the scrub oaks, my only other animate companions were the insistent flies exploring last night's scrapes with cold little mouths. Soon I passed the first sign of an ancient presence. 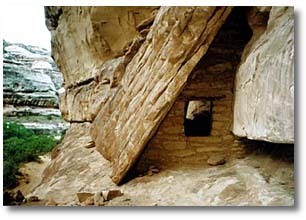 Jailhouse Ruin, named for a small, barred window, filled a ledge high up one canyon wall. A second ruin at the junction of Kane Gulch and Grand Gulch, even higher than the first, shared the same split-level design. Between ground-level structures and others on ledges far overhead stretched 10 to 50 feet of blank, vertical sandstone. Archeologists argue over why the Anasazi, who once flourished throughout the Colorado Plateau, chose to build their homes in such inaccessible, paranoid locations. Tree-ring evidence points to a series of severe droughts in the 11th and 12th centuries that would have laid waste to the fragile ecological balance on which their primitive agriculture depended. Others say they multiplied too quickly, leaving more mouths than this harsh environment could support. Many theories imply a sudden societal collapse, a culture gone haywire. There is even mounting evidence of cannibalism. Most researchers agree that by AD 1300 the remnants of the Anasazi (recently redubbed the Ancestral Puebloans) migrated south and east into Arizona and the Rio Grande Valley of New Mexico, where their descendants still inhabit dozens of traditional pueblos. I found my first unnamed ruin after lunch, a short way up Grand Gulch itself. A circular structure like a lookout tower sat on a ledge 50 feet up the south-facing wall. Behind a slab leaning against the cool rock face, a perfect triangular wall contained a tiny window with a wooden lintel. Previous visitors had lined up pot shards and thumb-sized corncobs along one low wall. Fingerprints dotted the mud mortar holding the stones together, centuries after it had been pressed in place. I crouched on the ledge as the wind tossed clouds across the graying sky, wondering how I could escape if the fugitives appeared around the next bend. I tried to imagine what it would have been like to live here, huddled with my extended family in this tiny space. Green stalks of corn would have carpeted the canyon floor, waving in the breeze. I could almost hear the patter of children's feet, bare as the rock they clambered over, inches from the edge. The smell of squash cooking in the embers, the grunt of an older relative -- an aunt? -- sewing turkey feathers into a blanket with a needle made of bone, preparing for the coming winter. What kind of fear could make us build so far above the canyon bottom, our crops, our water? Who -- or what -- would make us pull up the ladders? But daily life would go on, even in the face of such a threat. Perhaps, after a lean dinner of rabbit cottontail and prickly pear fruit, we would mix red sand with animal fat and print our palms on the wall behind us, marks of our passing that would long outlast us. An ill-advised scramble to the rim of the canyon and back left me exhausted by nightfall. After an hour of hiking by moonlight I left the trail, spread my sleeping bag on the ground, and collapsed. The next morning I came across the Split-Level Ruin just around the next corner. Pictographs of animals, hand prints and what could only be prehistoric doodling covered the back wall. Pottery chips with a carved wave pattern lay in the dirt next to maroon pieces of chert, probably cast off when someone chipped a spear point. I made surprisingly good time on up the rest of the gulch. A surreal scene waited at the mouth of Toadie Canyon. A fire had burned the bark off a grove of large cottonwoods, leaving smooth white trunks and blackened branches clawing at the sky. Upstream from here the walls were more rounded, somehow friendlier. Grasses filled the wide bottom, adding a touch of living color to that incomparable combination of rust-colored rock and deep blue sky. Junction Ruin filled a huge overhanging alcove at the junction of Kane Gulch. A well-preserved kiva, a round underground ceremonial room, gaped roofless. I looked for the name of Richard Weatherill, a Colorado rancher who excavated many high-desert ruins at the turn of the century, said to be carved into the stone, but couldn't find it. The final steep scramble out of Kane Gulch emptied into a cow pasture. I stumbled to the ranger station barely able to walk, but found new muscles in my legs for the ride back to the car. In 3 days I hadn't seen another person. After dinner in the town of Mexican Hat, I drove off the edge of Cedar Mesa down 1,000 feet of hairpin gravel curves with no guardrail. I spent the night in the Valley of the Gods, where rock monoliths threw hundred-foot shadows in the full moon's light. 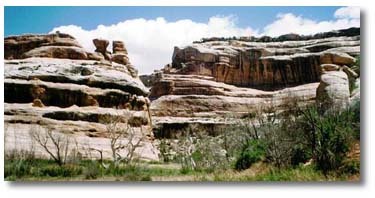 The Grand Gulch Primitive Area is south of Natural Bridges National Monument in southeastern Utah. The Kane Gulch Ranger Station is on State Route 26, four miles south of Route 95 and the monument. This place's secret is starting to get out, so the Bureau of Land Management is now charging $8 per person for a limited number of overnight trip permits. 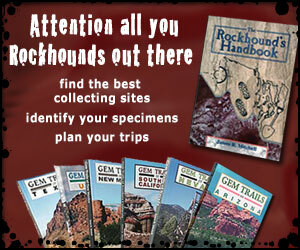 These can be reserved in advance from the BLM office in Monticello, Utah (435) 587-1532. Day-use permits are $2 per person. The nearest towns for supplies are Mexican Hat to the south on State Route 163 and Blanding to the east on U.S. 191. The Bullet Canyon to Kane Gulch hike is 23 miles. 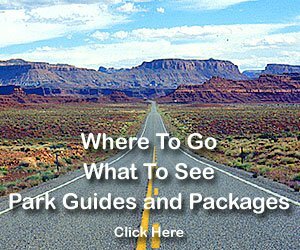 It's also possible to exit Grand Gulch at Collins Canyon, 38 miles from Kane Gulch (30 miles from Bullet), or to hike all the way down to the San Juan River, an epic 52-mile journey. Stream flow varies with the seasons, so ask about water availability ahead of time, and carry a filter or iodine tablets to purify any you find. Pictographs and ruins abound the entire length of the canyon and up many side branches. Most of the sites are still unexcavated and very fragile, so leave things as you find them and don't enter any structures. Under the Archeological Resources Protection Act, it's a felony to disturb such sites on federal lands. The sandstone at Arches National Park has provided the palette for sensational desert vistas and arches, making this park unique. Nature has used wind, rain and ice to carve fantastic desert vistas and arches. Join the team on a tour of some of the incredibly beautiful natural features at Arches National Park. Canyonlands National Park, located in the Colorado Plateau region, is a showcase of geology. Rivers divide the park into three districts, the Island in the Sky, the Needles, and the Maze. While these areas share a primitive desert atmosphere, each exhibits a distinctive character, and offers different opportunities for exploration. Lake Powell - The completion of the Glen Canyon Dam in 1963 created Lake Powell. It took another 14 years to fill the lake. With almost 2,000 miles of shoreline, and five marinas, Lake Powell has become a major attraction for millions of visitors from all over the world. Take a look at Lake Powell and enjoy this desert combination of red sandstone formations, water and clear blue skies.